Lisa Wolford of Deerfield was so grateful for Concord Hospital Payson Center forCancer Care oncology dietitian Megan Ryder (pictured) that she made a donation to Concord Hospital Trust in Megan’s name. Megan was grateful that the honor provided a generous reminder that patients and their families appreciate her important work. Lisa went to Megan for help at avery difficult time. 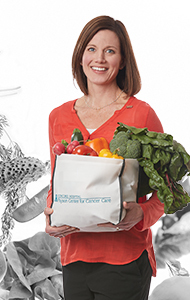 Her partner, Pam Hanglin, was beginning chemotherapy for colorectal cancer. Lisa wanted to make sure their diet wasn’t feeding Pam’s cancer and was seeking ways to help make the chemotherapy more bearable. During their emotional visit, Megan gave Lisa a few things, including a box of tissues. She also passed along recipes and studies that confirmed Lisa’s suspicions that sugar should be limited to help prevent cancer and avoid helping cancer cells grow. Most importantly, Lisa said Megan gave her a sense of some control in the fight against a disease that often leaves patients and their loved ones feeling helpless. She also was amazed that Megan’s services were available to her even though Pam was being treated elsewhere. Lisa was so grateful for the concrete ways she could help Pam that she wanted to say thank you to Megan with a donation. Concord Hospital Trust suggested a Halo award in Megan’s name. The award allows grateful patients or family members to donate in recognition of specific healthcare providers, employees or entire Hospital departments. Megan’s Halo pin is in her office,a grateful reminder that her work and her compassion make a difference.